I'm using the pulses from my John Deere generator for my tack signal into my EIS. Everything is working fine, and I've got a good solid signal. However, I'm not positive that I have it calibrated correctly. If someone with a JD generator that isn't mounted could tell me how many pulses it makes for each revolution, I'd be very thankful. Is the generator gear driven or belt driven? How about using an optical tachometer to compare to the EIS? You only need to check at one speed . . .
digital sensing is exceedingly linear! I have designed and built an optical tach for checking prop speed, using a PIC, a photodiode, and a four digit LED display. You point it out of the window through the prop disc as you fly along It’s the size of (and runs from) a pair of AA batteries. You can use it for checking a drill speed too if you put two pieces of silver tape on the chuck.Total part cost is about $7. It shows what you can start to do with a $1 micro controller. Do you think the list would like it as a build-it-yourself project? It’s a good intro to SMT soldering. --> AeroElectric-List message posted by: "user9253" <fransew(at)gmail.com (fransew(at)gmail.com)>What kind of engine?Is the generator gear driven or belt driven?How about using an optical tachometer to compare to the EIS? Agreed. There are a number of low-cost, laser tachs that are quite accurate. Here is one example.https://tinyurl.com/y76qb9w6 This one's sensing distance is rated at 500mm (about 20") but it can be a lot greater. Put strips of aluminum duct tape on the back side of the blades and use the tach on a dark ramp. I think you find that you can read the blade passes quite well. You only need to check at one speed . . . digital sensing is exceedingly linear! Engine idle would suffice. Bob . . . I have the JD generator driven directly by the crank. One crank rotation equals one generator rotation. I found a video of someone repairing the generator, and it is obvious that there are 12 stators. So, six pulses per rev it is. Doing more tuning today, and got the engine running smoother. I've convinced myself that my tack is correct. --> AeroElectric-List message�posted by: "user9253" <fransew(at)gmail.com (fransew(at)gmail.com)>What kind of engine?Is the generator gear driven or belt driven?How about using an optical tachometer to compare to the EIS? This sounds like a fun DIY project. I'd like to try it if you don't mind putting together the instructions. Thanks! I have designed and built an optical tach for checking prop speed, using a PIC, a photodiode, and a four digit LED display. You point it out of the window through the prop disc as you fly along It’s the size of (and runs from) a pair of AA batteries. You can use it for checking a drill speed too if you put two pieces of silver tape on the chuck. Total part cost is about $7. 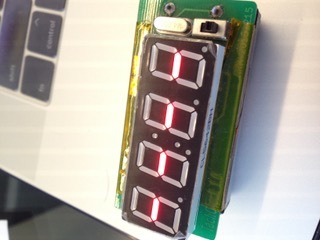 It shows what you can start to do with a $1 micro controller. --> AeroElectric-List message posted by: "user9253" <fransew(at)gmail.com (fransew(at)gmail.com)> What kind of engine? Is the generator gear driven or belt driven? How about using an optical tachometer to compare to the EIS? Agreed. There are a number of low-cost, laser tachs that are quite accurate. Here is one example. https://tinyurl.com/y76qb9w6 This one's sensing distance is rated at 500mm (about 20") but it can be a lot greater. Put strips of aluminum duct tape on the back side of the blades and use the tach on a dark ramp. I think you find that you can read the blade passes quite well. You only need to check at one speed . . . digital sensing is exceedingly linear! Engine idle would suffice. Bob . . .